Many people assumed that merely reducing emissions was all it took to avoid dangerous warming. However, emission reductions alone is not enough to avoid continued warming in many locations for considerable periods of time. Why is this the case? Firstly, there is considerable lag in how the climate responds to human emissions. 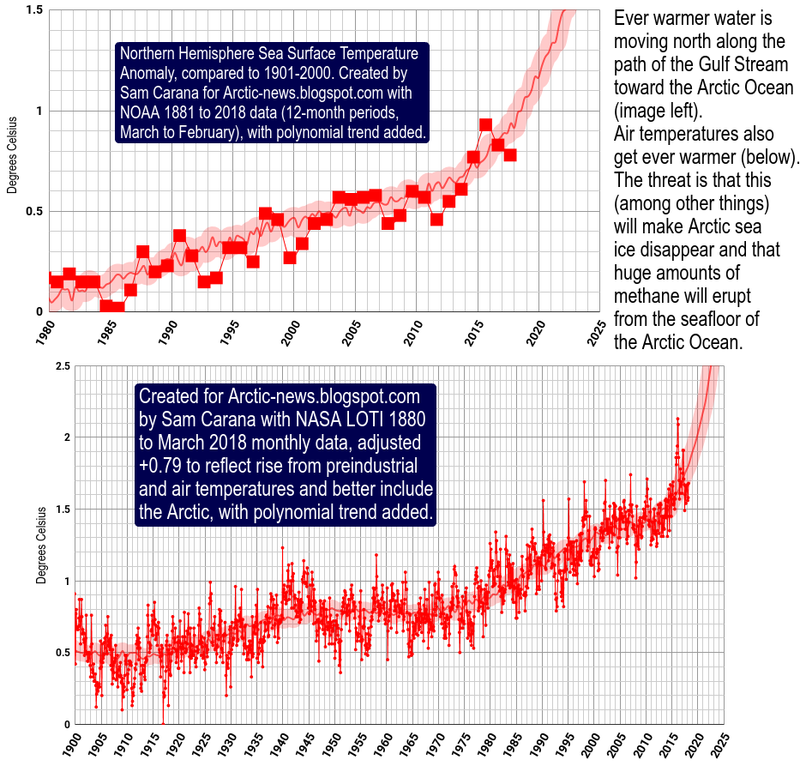 Forests, oceans, snow and ice currently still buffer a lot of heat, but in many cases they are turning from sinks into sources of further warming. Once certain processes are set in motion, natural recovery may take a long time, such as in the case of ocean acidification, collapse of ecosystems, tundra wildfires, and loss of sea ice and glaciers. Secondly, warming will continue because current emissions contain aerosols (in particular sulfur) that mask the warming effect of (the other) emissions. Therefore, if all emissions were suddenly stopped, this masking effect would also stop and the Earth would suddenly feel the full impact of all the emissions of the past. Therefore, emission reductions alone is not enough to avoid that warming will continue in many locations for considerable periods of time. Can we run the risk of allowing such warming to continue? Many people believed it was safe to allow a 2 degrees of Celsius warming from pre-industrial times. 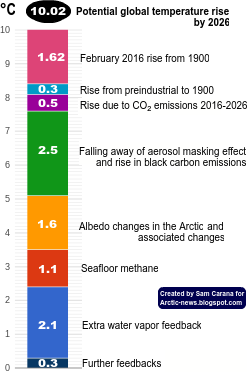 However, even a small amount of warming globally will result in a lot of warming in specific places, particularly in the Arctic, where huge amounts of methane are ready to be released abruptly. Such methane releases in the Arctic could trigger runaway warming that feeds on itself. The potential scale and intensity of such impacts and the precautionary principle mean that action must be taken immediately to reduce this risk. Obviously, reducing emissions should be part of a climate action plan. Furthermore, given the need to avoid dangerous warming, responsible geo-engineering must be included as an indispensable part of a comprehensive climate action plan. Possible geo-engineering methods include reflecting more sunlight back into space, breaking down or capturing pollutants, and otherwise creating conditions to improve the situation such as by targeted heat transfer and increased outward radiation. The most immediate effect can be expected from methods to reflect more sunlight back into space and to break down or capture methane in the Arctic. Furthermore, carbon dioxide, one of the most important drivers of global warming, can stay in the atmosphere and oceans for a very long time, without prospect for recovery without the use of methods such as enhanced weathering, pyrolysis of biomass and biochar burial. In conclusion, both in regard to immediate emergency measures and in regard to long-term climate restoration, responsible geo-engineering must be included as an indispensable part of a comprehensive climate action plan. There is considerable lag in how the climate responds to human emissions. Current emissions contain aerosols (in particular sulfur) that mask the warming effect of (the other) emissions. Consequently, reducing human emissions alone will still result in continued warming in many locations for considerable periods of time. There is an unacceptably large risk that such warming will continue far beyond catastrophically dangerous levels, e.g. in case of large abrupt releases of methane from hydrates. This is particularly apparent in the Arctic, where several factors combine to increase the risk, with flow-on impacts elsewhere. Geo-engineering methods can be helpful in reducing this risk, e.g. by reducing warming and/or by reducing pollutants in the atmosphere and oceans. Carbon dioxide, one of the most important drivers of global warming, can stay in the atmosphere for an extremely long time. Therefore, responsible geo-engineering efforts must be included as an indispensable part of a comprehensive climate action plan. To improve this line of reasoning, further discussion is welcome, with a focus on scientific findings relevant to each of these points. If you feel you can improve this paper, please post a comment below, or send a message to (one of the) author(s). Efforts to keep heat down and Earth's systems functioning and life depends on fundamental value. That fundamental value is missing from money now. If the people of Earth maybe by UN, maybe by Barack saying something in his response to me- is still time to keep Earth alive.? I just wish the people advising some of these people, intelligence were able and willing to speak up for the little guys and keeping Earth alive..